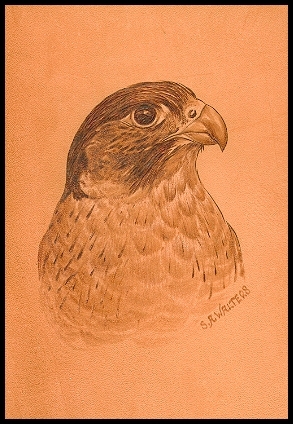 It's my intention, through this newsletter, to explore as many aspects of pyrography as possible. Quite the undertaking when you consider, not only the amazing variety of pyrographic techniques, tools and materials, but also the unexplored potential. In each issue I try to expose and explore one aspect of pyrography. In doing this I hope you will become aware that pyro is not as one dimensiononal as plain old wood burning. (Not that there's anything wrong with that!) But there is a sea of possibilities for you to pick and choose from if you wish. It's my job to help show you....to wet the taste buds. Most often I will write in relation to something I'm currently working on or experiencing...making it fresh and first hand. In keeping with this, I'll be writing about leather work in this issue. I'll also be talking about the Sydney Wood Show in Part 3 of When the Market Stalls....plus lots more. One last thing. Thanks for the nice words of support about Mum. Her back is getting a little better each day. That and work keep me totally snowed under, so unfortunately my usual support of various groups has had to be put on the back burner. Okay...let's get this issue on the road. I hope you enjoy. P.S DON'T FORGET TO UPDATE YOUR BOOKMARKS! 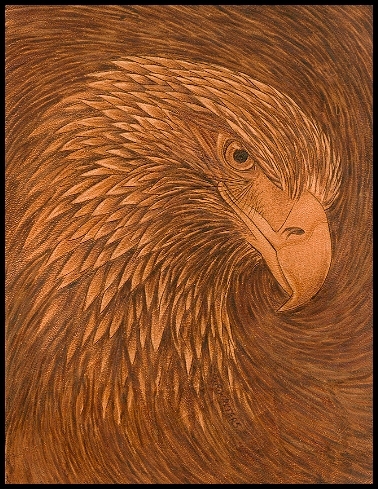 Sue Walters Pyrography has moved to it's own domain of www.suewalters.com. Not only is it easier to remember, but I now have plenty of room to make THE PYRO SCHOOL ONLINE! DO YOU KNOW SOMEONE WHO WOULD WANT TO SUBSCRIBE TO MY NEWSLETTER? They can sign up by clicking the link below. Please note that some spam security setting can prevent the Pyro Newsletter from getting through. Please be sure to add pyronews@suewalters.com and suew@suewalters.com to your 'friends' list. I LIKE leather burning a lot! There's something about not having to fight grain that I like. Perhaps it's because I lack patience. But I must admit I also like the look of it...the earthy tones and unique marriage of burning to hide. There are some amazing examples of leather burning on the net, but I was first introduced to it by a generous and gifted artist named Adri Pretorious. If you want to check out some great leather burning then a visit to Art By Fire will do you well. Thanks to Adri I learnt the basics of leather burning but, because of other commitments, I never found the time to do much of it. 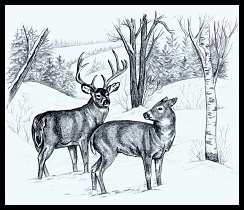 I've finally had a chance to try now because I decided I wanted to develop a small range of wildlife sketches on leather for sale. This came about for two reasons; to diversify my art (see When the Market Stall, bellow) and also because I can work fast on leather. This Wedge Tailed Eagle was done on cow hide. I decided to do a swirled dark background to accent the light. I'm honestly not sure if it made it better or worse. Not to worry, it was interesting to try. It's a lovely material to burn on when you have a decent piece of leather. The ability to use a shader to broadly sketch seems a lot easier than on other surfaces...this I like because I admit to getting a little impatient with how slow burning can be at times. Leather needs a cooler heat to burn on so a burner with the capability of a low heat is required. This makes a lot of the fixed temperature irons perfect for leather burning as they tend to be cooler than some other burners. It's important that you only burn on vegetable tanned leather. Some leather is treated with metals and chemicals and this is dangerous to burn on. It's usually the soft leathers used in clothing etc, that are treated this way. This little piece was done very quickly too. I was particularly pleased with how soft the chest feathers appeared. Here lies the biggest problem I've heard regarding burning leather; that it's hard to find nice clean leather that's good to burn. It's either too dark, too marked, to thin or not the right size. So I ended up going to a special leather merchant and hand picking a side. It was very expensive but well worth it because I know exactly what a pyrographer needs and can pick the best myself. While I was there I bought a Kangaroo hide too. I must admit I wasn't keen on this because I love the Roos, but they do have to be culled to prevent them starving to death when the numbers are too high, so that eased my conscience a little. I've tried burning on Roo hide once before and found it a good surface. It's a little thinner than cow. After I bought the hide I got to work sketching up some critters, deciding to focus on Australian wildlife themes and dogs. I say they are sketched because I have limited each one to being done in an hour or less. I can't afford to take the time to get them perfect because this will make them too expensive to sell quickly. The aim is to do them fast and have them priced to appeal to a wide range of shoppers. This Little Wren appears soft compared to the other. I think it's because of the technique I used. 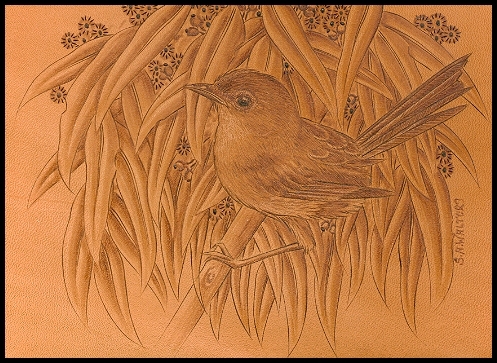 I'm glad I did the little bird first and then sketched the gum leaves in later. That way I could keep them soft and married in appearance to the little bird. This one took about an hour. The positives? It was FUN! I found I could go from the softest of tones, right through to black. It held a tight line very well and the control of lines seemed to be easier because the nib was sunk into the surface, making it bite in and steady the line. It was faster than wood burning and I liked that you can easily scratch back into it to highlight. It looks very unique and creates quite a talking point. It's also easy to mount of frame for presentation. The other plus is you can do it on functional items: belts, bags, horse gear etc. The negatives? It pongs! (Aussie/British for 'smells', 'stinks'.) I didn't actually mind the smell at all, but I can see if you find the smell of burning hair a bit on the wafty side, it might put you off a tad. (Not that I'm into that particular smell, but you get my drift. Some people have far more sensitive honkers than mine.) The leather took the heat very nicely if it wasn't turned up too hot, but if I tried burning too hot it almost melted the leather. This is simply a control issue as you really don't need a glowing heat. The burn itself is dirtier than wood. It didn't seem to smoke much at all, if ever, but the nib did manage to gunk up a lot compared to wood. The other drawback I can envisage is, if the leather is too dark you could have a lack of contrast in your work if burning monochrome. (I'm yet to try colour but am very much looking forward to it and will report in to you on this experiment.) One last negative is that leather can darken in strong light, so keep this in mind when hanging...just like you must with wood burning. All in all it impressed me enough to know I will continue working with it in the future. I've stared this piece on some of the new hide. Remember to try and get a hide that is pale if you want to achieve a good contrast in your work. In this picture you see me using a flat shader to 'sketch' the coat of the dog in. You can see I've achieved near black on the nose. This piece is about half way through and is for a commission sample so I'm taking a little longer on it. I might make a visual diary of this one and will be having an online leather burning class. Hand picked by myself, this leather (as seen above) is pale tanned, smooth and unmarked. Perfect for pyrography. Due to the high cost of quality leather I will have to raise these prices soon. Before then I am selling off the remainder of this lovely side at the lower prices, as seen below. All prices include shipping and handling in Australia and air shipping internationally. THE POLL RESULTS ARE IN. CLASSES ARE BEING CONSTRUCTED. My thanks to all the people who have taken part in the poll I've been conducting into what subjects you would like to learn and see the most. Many hundreds of replies later and it has become clear what the first online classes will be. The other subjects will follow, but I feel it's best to cater to the greatest number of people to begin with. The first classes will be on the follow subjects: 1) Monochrome wood burning. 2) Colour wood burning 3) Leather burning. Gourd burning,negative burning, paper burning and others will soon follow. I may though, have a negative burning class sooner as I have a project in mind and it would be a good opportunity for us to work through it together. I am constructing the class rooms and setting up the lessons now. I anticipate the classes can start around the end of August. (I have the Adelaide Wood Show and 2 weeks holiday to get through before hand. My first holiday in years! :)) I am going to have the first wave of classes at a reduced price in case there are any teething problems. (Your patience deserves a discount.) I have a large list of people who have expressed interest in taking online classes and I will be contacting those people first with this offer and the details of the classes. I can tell you I'm trying to make classes as interactive as possible with full hands on participation by myself, interaction with fellow students and step by step projects. If anyone else would like to be added to the list to be notified about classes, please drop me a note to LESSONS and I'll be sure to Email you. This is absolutely without obligation. It simply means you get notified as soon as classes are soon to commence and you will get the option to sign up first before the class fills. Classes will also be announced in the Pyro Newsletter, on the home page and in the Pyro Classroom. No doubt this is going to take a whack of working out and is quite complex to get going, but I think it's going to be worth it. We are so spread out in the world and the call to learn more about burning is loud, so hopefully this classroom will be able to help fill the void. In Part 2 of When the Market Stalls, we had a look at product diversity and how casting a bigger net can improve sales. I think this bears looking at a little further after the experiences at my last wood show. The Sydney Wood Show at Fox Studios has come and gone and what a great show it was. The crowds were up by 20% and the place was buzzing with new products and a great craft display in the Horton Pavilion. I always try to go into a big show with something new to try�and always try to walk away having learnt something for the next one. My biggest beef at these shows is that so many of the stands and companies and products remain the same, year after year. It's static and gets a little boring so I set out to keep my booth interesting and fresh because I'm sure people don't want to come back year after year and see the same old thing. Of the people that go to these shows, I'm sure probably half or more go each year. A staple line, such as wood, must be offered as a standard, but if I'm to gain new customers I need to offer them something extra, new, something they want. For this show I decided to expand my range of art and products in a few areas. The areas depended on what I felt the public wanted. What I felt they wanted was learnt from observing, asking questions and, in some cases, simply taking a chance. I tried some new subject material, introduced some leather work, some new tagua work and also added several new products that support pyrography. It's always fascinating to see how the new offerings go. Sometimes I've been way off and it just didn't sell. In that case I don't put any more energy into that idea. But�sometimes the new ideas work and a new customer/client is born. Sometimes it's someone new who never would have thought to shop at my booth before, because I'm now offering them something they want. I'm casting a bigger net. The result? The crowd was up by 20% from the year before but my sales were up by 60%. It stands some thinking about if you want to make some money from your burning. Is your net too small? Do you appeal only to a narrow range of people? If the answer is yes and you are unhappy with sales, think about your product and how you can alter/add/improve it to add to your existing audience. Listen hard to what people are asking for�commenting on. Look at the other booths and learn from them. Why are they getting a bigger crowd than you? Go away from each show having learnt from it�even if it's just one small thing. Apply that to your next show and see what happens. I'll be doing that at my next show. I will increase my leather range because it sold very well and proved a real point of interest. I'll also increase my range of tagua work (because this has proved to be a consistently good line) and I will add to and extend a few product lines that proved to work in Sydney. There are, of course, other ways to increase your sales, one being presentation of your booth and product. We can have a look at that in Part 4 of When the Market Stalls. I hate to go a little heavy here, but I've noticed a couple of pyro sites where a piece of my work has been copied for the owners use and sale. I believe one of the pieces was copied from a posting I did to a pyrography group where I was explaining a technique. When I have the time I like to help out on the groups and know of many others that do also. Both there and here I like to feel free to show you all as much of my work as I can and would hate for a small minority to spoil it for the majority. So please remember to respect the image and the artist wherever you travel on the net. When in doubt, please ask for permission. A new visual diary has begun. This time we're taking a look at the making of a large piece called 'Platypus Diving'. 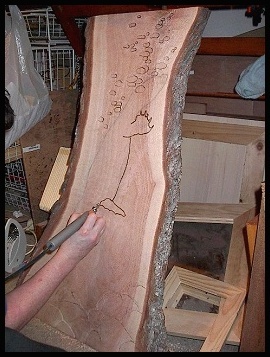 It's being done on a lovely slab of Grevillea robusta, the Silky Oak. This wood is an Australian native and very interesting to burn on to say the least. On the Diary Page you can also see links to past visual diaries. NEW! WOODBURNING PATTERNS ON C.D. If you are dying to burn but are having trouble finding subjects, this C.D. might be for you. 184 patterns and studies of North American Wildlife, Big Cats, Nautical, Bird, Coastal Scenes, Miscellaneous Design and Border Design. Super large format files to allow you to shrink patterns to suit any project size. Size, print and use time and time again. Bonus wood carving, sharpening and wood selection information. Samples of the patterns from the Pattern C.D. $19.95 U.S. Dollars. (Includes air shipping and handling.) $29.95 Australian Dollars. (Includes surface shipping and handling.) 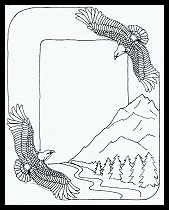 You can order The Wood Burning Pattern CD on the PATTERN PAGE. With my compliments, feel free to pick up your FREE PATTERN while you're there. Be sure to stand back now and then to gain perspective. Sometimes, because we burn so close to our work, we get a little lost in the details. Try standing back now and then to see the picture as a whole. I do this when something just isn't working. Distance will give me a better feel of the balance of the piece....especially if I'm not sure if a certain part should be lighter or darker. It's also a good idea to take a break from a particular piece if you are struggling with it. It's amazing how fresh eyes will find the solution much faster than tired ones.